Compress PDF, Microsoft Office and JPEG files with NXPowerLite Desktop: NXPowerLite Desktop shrinks files making them easier to email. Compress PDF, PowerPoint, Word, Excel and JPEG files in seconds without changing the file format. NXPowerLite reduces the size of large PDF, Microsoft Office and JPEG files in seconds. Just choose a file, click 'Optimize' and watch as a new smaller copy of your original is created. NXPowerLite reclaims storage space by replacing large PDF, Microsoft Office, JPEG and TIFF files with smaller optimized versions. It runs automatically, reclaiming wasted capacity, slowing down storage growth and keeping your servers running smoothly with minimal effort. Licenses of NXPowerLite Desktop are provided at a one-off price for unlimited use and the license is per user not per computer. NXPowerLite will compress PDF, Microsoft Office, JPEG, PNG and TIFF files simply and effectively making them easy to email. It is especially effective on files that don't Zip. 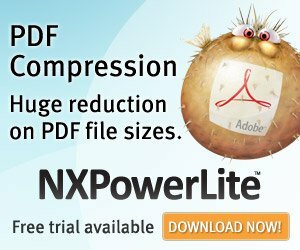 ​Compress PDF, Microsoft Office and JPEG files with NXPowerLite Desktop: NXPowerLite Desktop shrinks files making them easier to email. Compress PDF, PowerPoint, Word, Excel and JPEG files in seconds without changing the file format. NXPowerLite reduces the size of large PDF, Microsoft Office and JPEG files in seconds. Just choose a file, click 'Optimize' and watch as a new smaller copy of your original is created.